Last morning in Sydney; almost time to go home. After checking out of the hotel, we headed back to the gallery to see if Sunday morning was a better option for looking at the Archibald Prize finalists than Friday had been. On the walk, the last of the half-marathon runners were coming through, including one old bloke, jogging along to the encouragement of passers-by and event organisers. 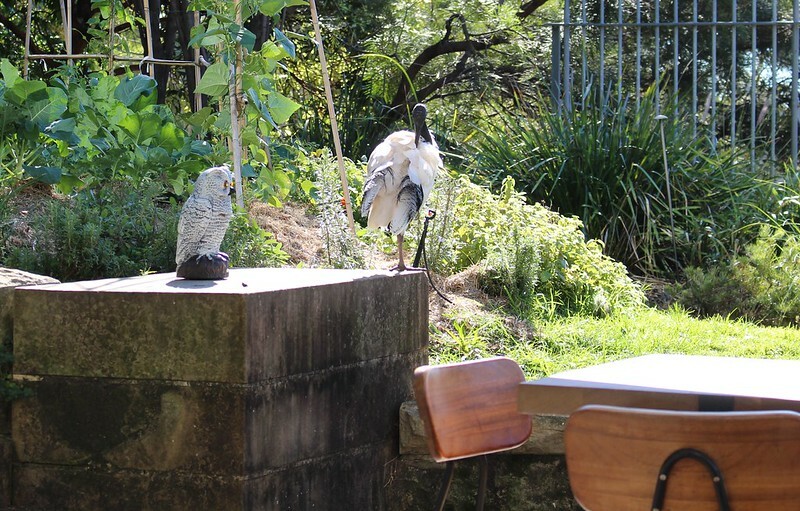 First, a bite in the gallery cafe for breakfast, while trying to keep the ibis away from our food. They didn’t seem spooked by the fake owl. Then we looked around the exhibition. Some great works, both the Archibalds and finalists from the Wynne and Sulman prizes, also on display. From there another walk across the park and a poke around the shops for a bit. 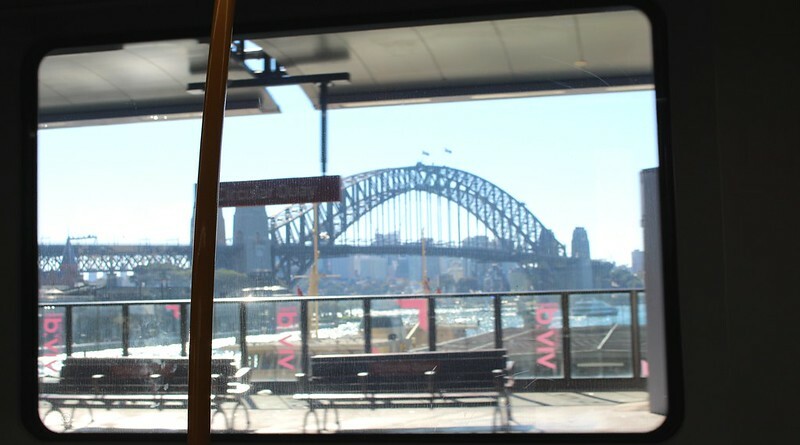 Back to the hotel to pick up the bags, then we headed for St James Station — drawing another bum card, as again due to works we went around the City Circle the wrong way (but hey, that Circular Quay view!!) and had to change at Central for the Airport line. 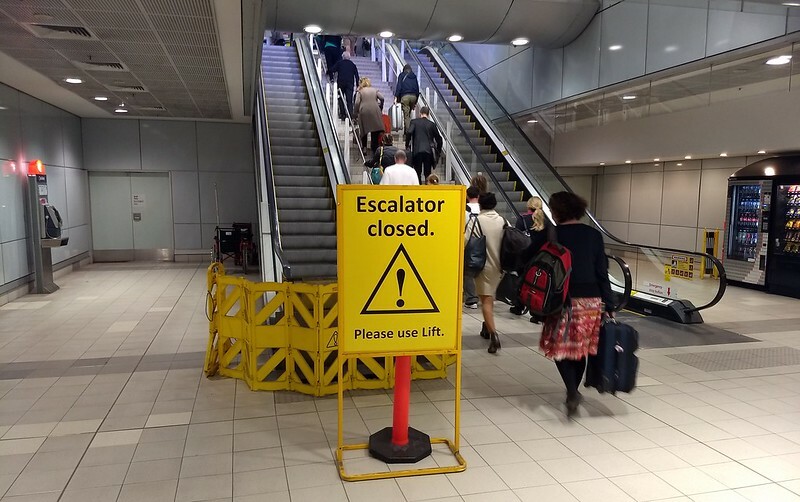 No matter, back at Sydney Airport in plenty of time, no thanks to a faulty escalator at the Domestic station. As I mentioned, we ended up flying back Business Class on points. 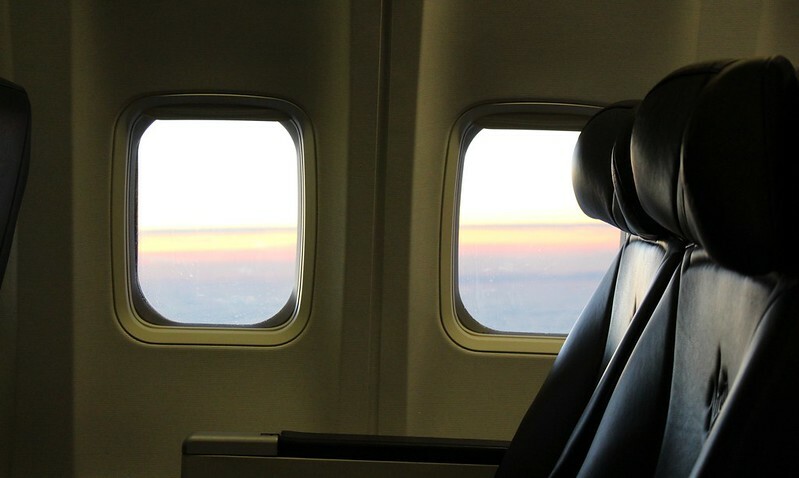 The following may seem trivial to people who usually fly Business, but as someone who has only previously flown Economy, I found it an interesting contrast. The Virgin lounge was pretty busy, and apart from the complimentary food and drink, perhaps little different to the public areas of most airports these days. WiFi and power for a laptop and somewhere to sit are pretty common. The really luxurious place in the airport is something I’ve only heard about (and don’t expect to ever see inside): the Qantas Chairman’s Lounge. 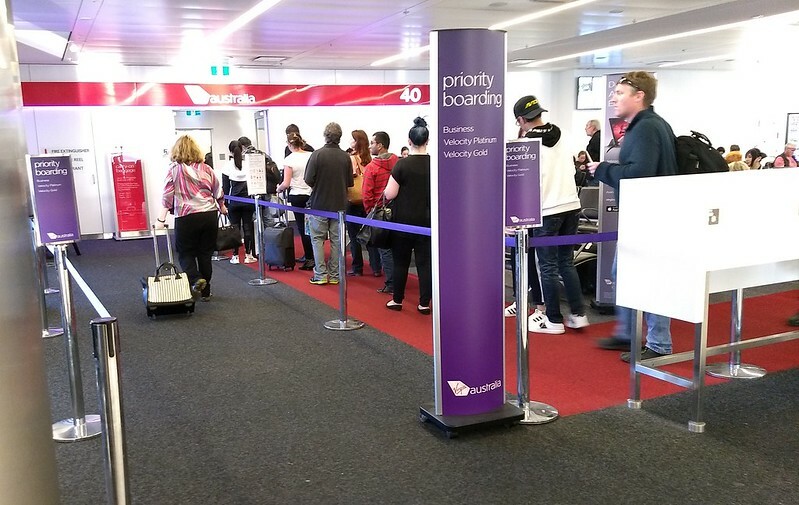 Perhaps more advantageous than Virgin’s lounge was priority boarding, skipping the queue. Mixed feelings: guilt for jumping the queue, rock star for walking straight in, but fraud for doing it on points! And once aboard – the seats are certainly much more spacious. And personal service – would you like a drink before we take-off, Mr Bowen? We got a good view as we took off, but you can get that from any window seat. Of the eight Business Class seats in the plane, four were taken, four were empty. Being much a bigger seat, you get more window. And at the front of the plane you get a better sense of what’s going on, as the flight crew chat among themselves, and you can see the pier closing and moving away before the plane pushes back. On the way up to Sydney in Economy (departing 7:30pm), we’d been given a packet containing five cracker biscuits and five slices of cheese. 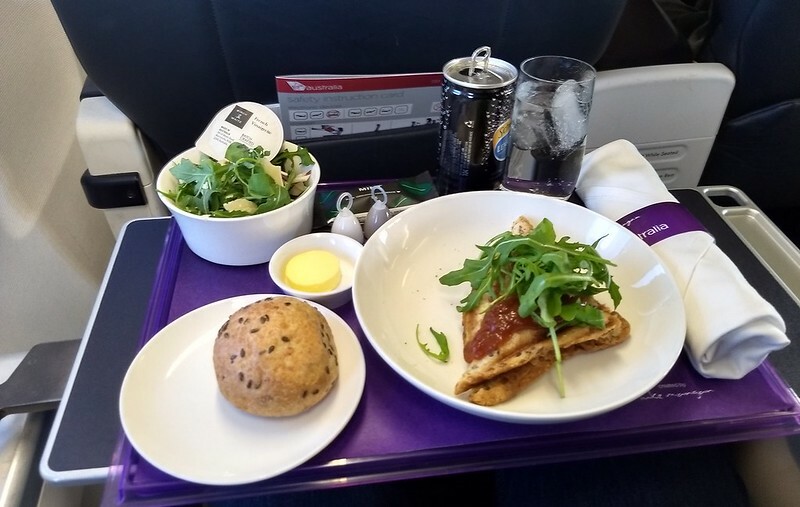 Coming back in Business Class (departing 4:30pm), it was a full meal with a choice of options – I went for the Moroccan lamb jaffle. On a real plate, with real metal cutlery and a cloth napkin. After landing, one of the hosties positioned herself in the aisle to make sure us high flyers got to leave first, without the hoi polloi from Economy getting ahead of us. Priority luggage allowed me to leave the terminal several minutes quicker, and get on a Skybus sooner (I only just caught it), with an earlier train connection home. So it got me home more quickly. Maybe only ten minutes earlier, but it helped. Some people yearn for the olden days of air travel. The glamour, the personal service. This of course was a time when most people couldn’t afford to fly at all. But for those who did, there was more space and better service. Clearly you can still have it — to an extent — if you’re willing to pay for it. But it’s not cheap. 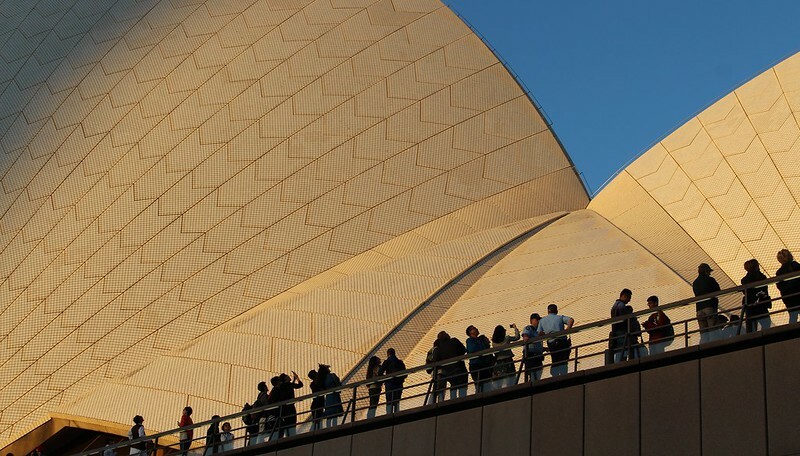 Checking Virgin’s web site, flights to Sydney start from $125 in Economy — for Business Class you’re paying at least $499 (for a Business Saver fare). I could get used to travelling Business, but my budget isn’t likely to allow it very often. Perhaps I’ll aim for the occasional points upgrade. Straight onto a Skybus back to the City. Unlike the slow trip on Thursday night, this was a quick 23 minutes, at full speed along most of the freeway. It could have been a minute or two faster if there was traffic light priority when the bus left the freeway at Footscray Road. Then straight onto a train home — noting that since the removal of seats around the doorways, there are very few spots in the Alstom Comeng trains where you can sit, and have your suitcase with you, but out of the way. 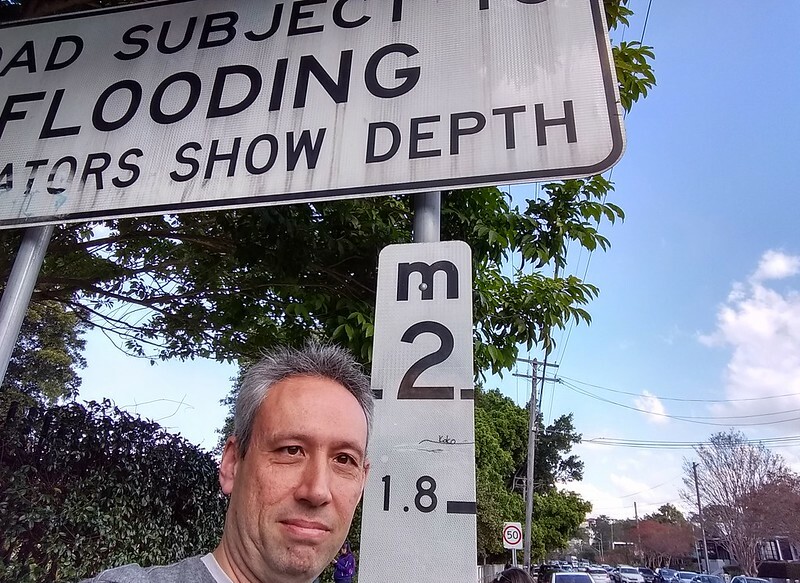 After a few days of sun in Sydney, I was back in drizzly cold Melbourne. But with such a relaxing flight home, it didn’t matter a bit. Sydney getaway continued. First stop: a bakery in the Queen Victoria Building, the spectacular 19th century shopping arcade, where we grabbed some croissants for breakfast. 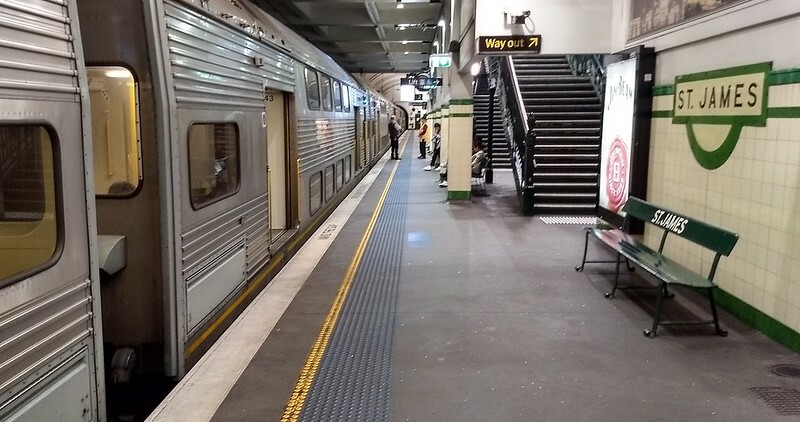 Then to Town Hall Station to hop on a train to inner-city Redfern. 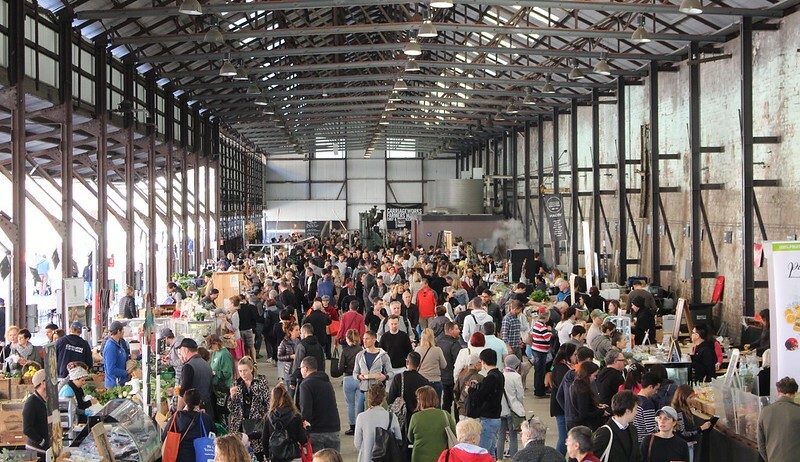 A short walk from Redfern Station is Carriageworks, a former… well, railway carriage workshop, where there’s a farmers market on Saturdays, and art in the adjacent workshop buildings, which have been converted into gallery spaces. 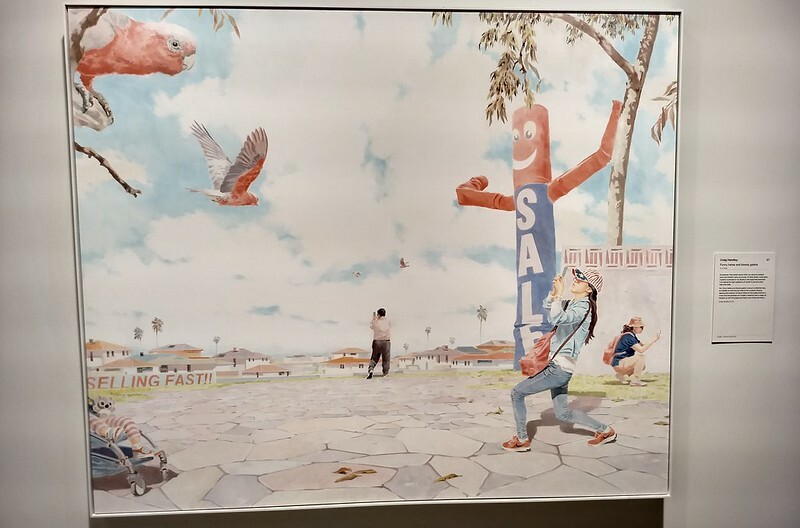 We browsed through the market — I bought a bottle of hot sauce to take home for my sons — then we took a look at the galleries: the Sydney Biennale was on. The interactive work “Constellations“ involved a huge white wall and a baseball bat. You take the bat and hit the wall, then listen to the sounds reverberating through the space. 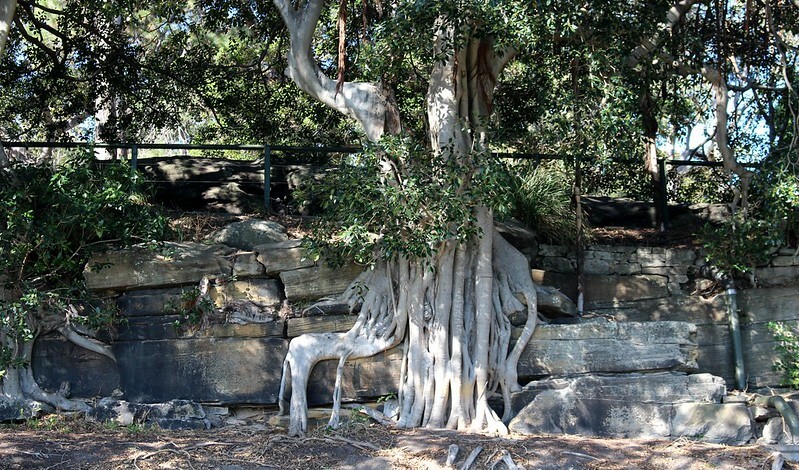 Unbeknownst to the audience, a concert-size public address system, including multiple subwoofers, microphones and related sound equipment, is hidden within the structure. The sound of the impact between bat and wall is amplified by a massive 120 decibels, reverberating throughout the gallery space and the building. As you can see from the video, when I had a go, there was a bonus, unexpected sound: that of a scared toddler who had just come around the corner, overwhelmed by the noise. Poor kid. Some of the other artworks were very cool as well, though nothing quite as interactive. 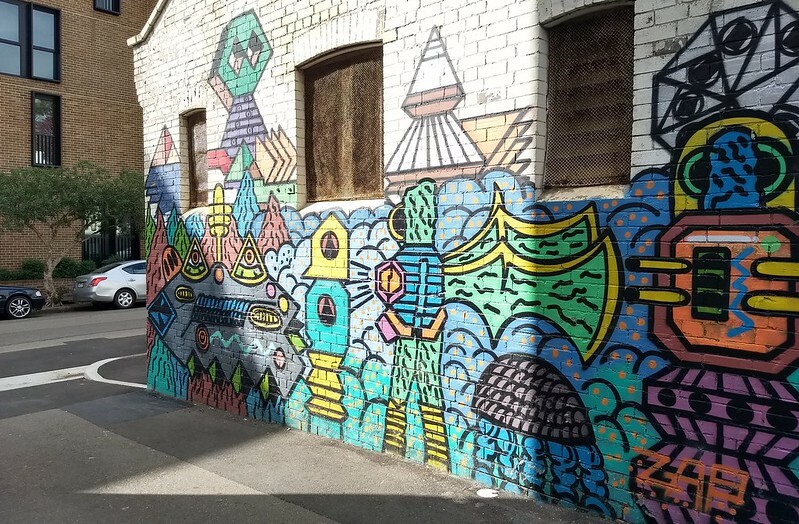 From there we had a walk around Redfern, to see if we could find any good street art. Eventually we found a little, but not much. 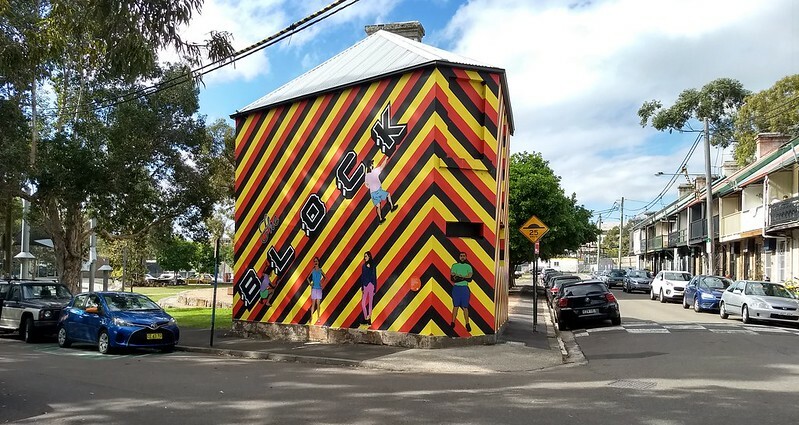 Ever tried Googling for “street art in Redfern”? No helpful results. Some lovely terrace houses though. We ducked back to the hotel to grab the present I’d brought up for my cousin’s daughter (that makes her my cousin once removed) and headed out to Marrickville. It’s a pleasant walk from the station to the park where we were meeting. It’s a very hilly area, and the council has created small parks in a few spots by closing off streets. Probably too hilly for playing football. A lovely park BBQ with my relatives, then we headed by train and bus to my friend K’s place in the inner-west suburb of Forest Lodge for some nibbles, wine, a home made stew and some entertaining conversation. We caught the “L1” Light Rail back into the city. The train tram was quiet at the western end, but got packed when we reached the Casino. We hopped off at Capitol Square and walked back to the hotel. George Street was awash with young party animals, and relatively few civilians, making it somewhat noisy, and the quiet comfort of the hotel even more welcoming. Hotel buffet breakfast at the Sheraton is an eye-popping $44 per person. This is no big surprise – hotel breakfasts are always expensive. But they’d said at check-in that we had a $50 credit, so that took the cost down to $38 for the two of us, which is probably cheaper than if we went out somewhere for breakfast. So we dined in — and very nice it was too. Three course breakfast? Why not! That’s okay — we would end up walking all day. The locations plotted on my Google Maps timeline for the day aren’t quite right. At no point did we walk on water, for instance. But given the glorious weather, we did explore extensively on foot — and all within a few kilometres of the hotel. 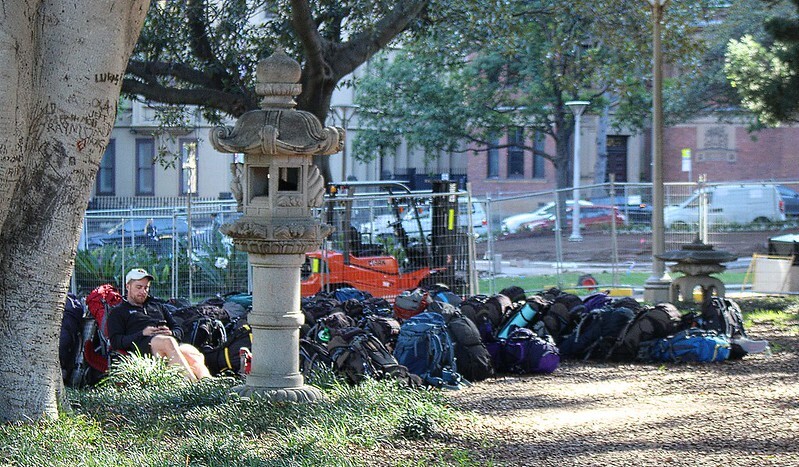 Heading out of the hotel, in Hyde Park we found preparation for the Sydney half-marathon, and this bloke from a backpacker tour group, minding all the bags while his compatriots were evidently elsewhere. One lesson I’ve learnt over the years is that if there’s a particular impetus for your trip, then if possible get that thing done as a priority. Just in case. 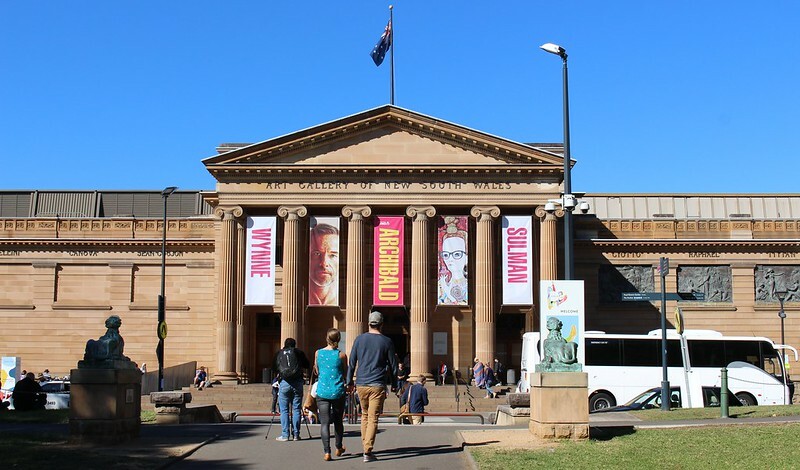 So we headed straight to the Art Gallery of NSW to the Lady and the Unicorn exhibit. Amazing 500ish year old tapestries visiting from France. When M had mentioned it to an acquaintance who had never heard of tapestries, it was apparently interpreted as some kind of culinary event. Apparently tapestries are delicious… because they’re closely related to tapas. We’d booked for 10:30am on Friday in the hope that being early on a work day, it would be quiet. It wasn’t — busloads of retirees seemed to be coming in, and as we looked around, it got busier and busier. Still good though; if you’re in Sydney in the next month or so, get along. We pondered also looking in at the Archibald finalists, also on display. The queue just for tickets was getting long, and we could see that inside it was very busy, so after a look around the gallery shop, instead we headed out for more walking. 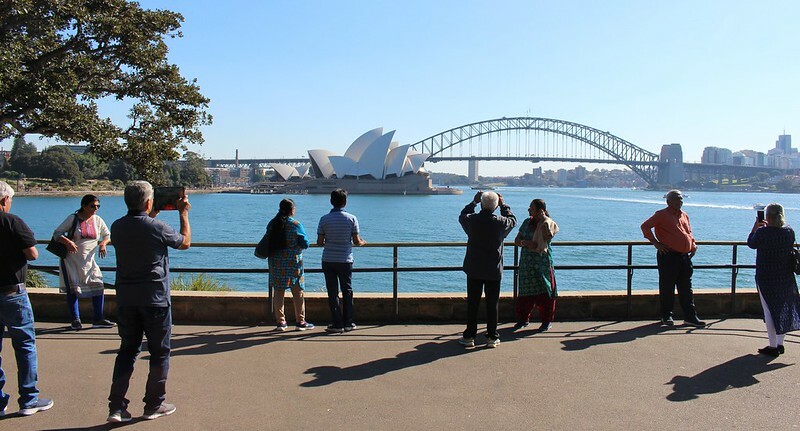 First up to Mrs Macquarie’s Point, where spectacular views were to be found, and we joined in the other tourists at snapping away at the Harbour Bridge and Opera House. At some stage my phone lost its data connection. Odd – I don’t recall that happening before. There was some confusion getting it resolved, as when I had WiFi, I checked Telstra’s outages page, which said there was a fault in the area. Telstra’s people on Twitter however suggested rebooting, which turned out to resolve it. Then we walked across the Botanic Garden. 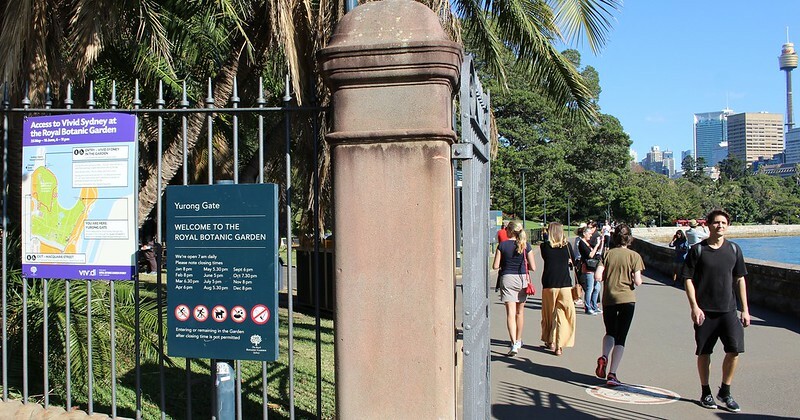 Why is it Garden, singular, when Melbourne has the Botanic Gardens? I demand to know. 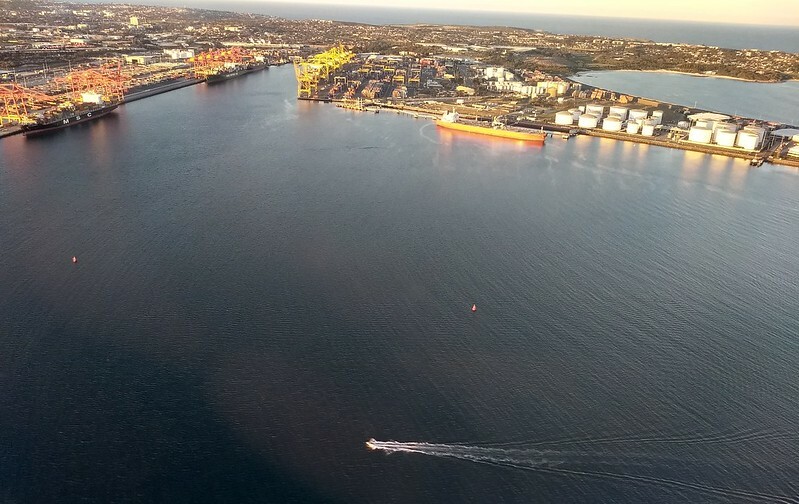 (If you’re wondering they’re a similar size – Sydney 30 hectares, Melbourne 38, though I suppose Melbourne also has a separate garden at Cranbourne). This VMS was flashing messages for the forthcoming Vivid festival, so naturally I snapped on particular message. On a recommendation of a friend, we had lunch at the Governor’s Kitchen, the restaurant adjacent to the Sydney Museum. One delicious yet relaxing lunch later (well, apart from perhaps a little too much traffic noise), we headed back to the hotel for a bit, then out into the CBD proper along George Street. 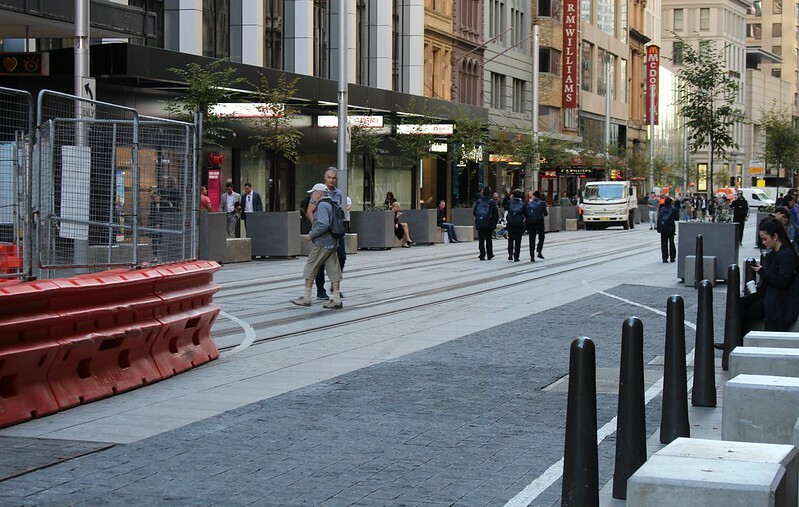 George Street used to be a wall of buses at peak times, but currently it’s being dug up for the light rail project. As you can see, they use concrete blocks for bollards in Sydney. 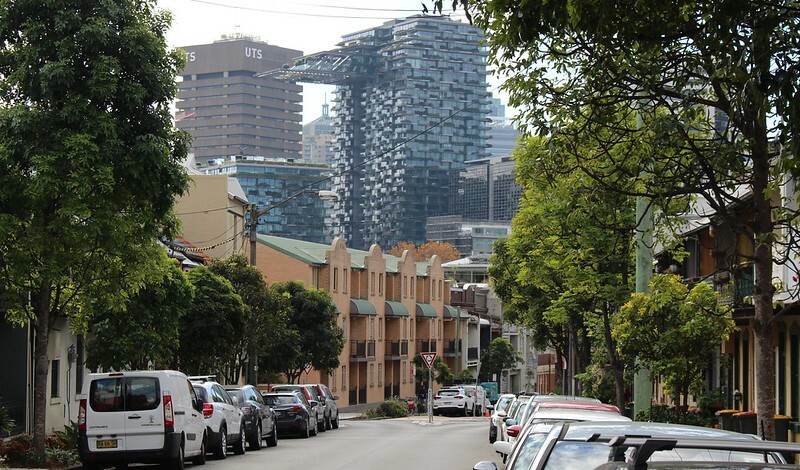 Except unlike in Melbourne, these don’t appear to attract litter or decorations. 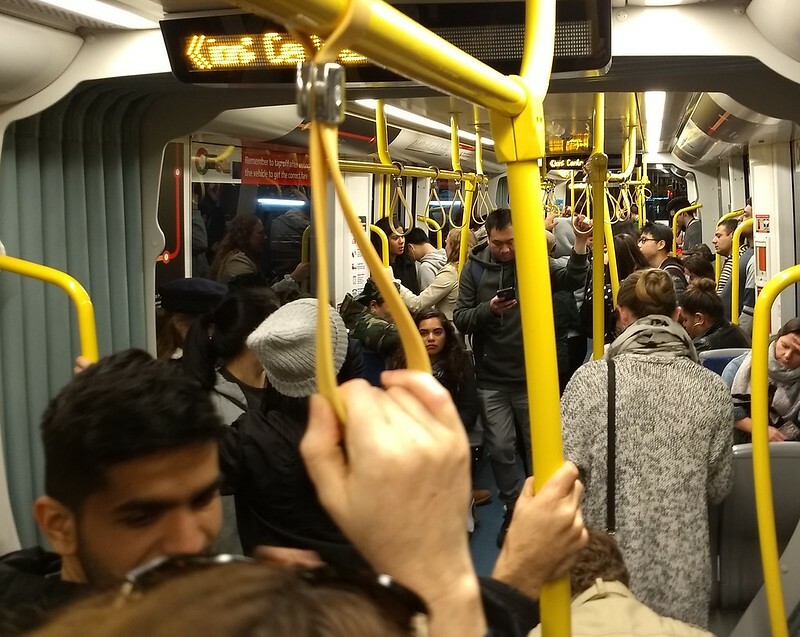 Some commenters from Melbourne who may or may not be fully informed have noted that while Yarra Trams might not be perfect, they’d have had the whole thing done and dusted within weeks. 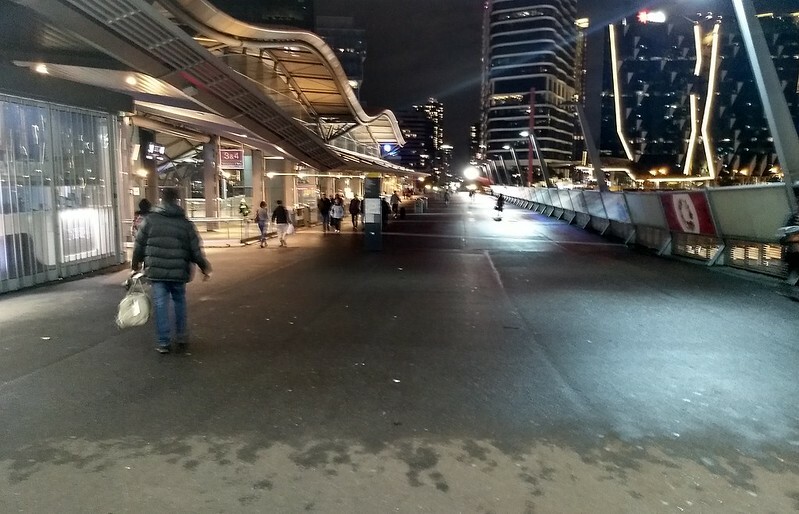 Witness the diversion/reconstruction of tram tracks along St Kilda Road – it took about two weeks. 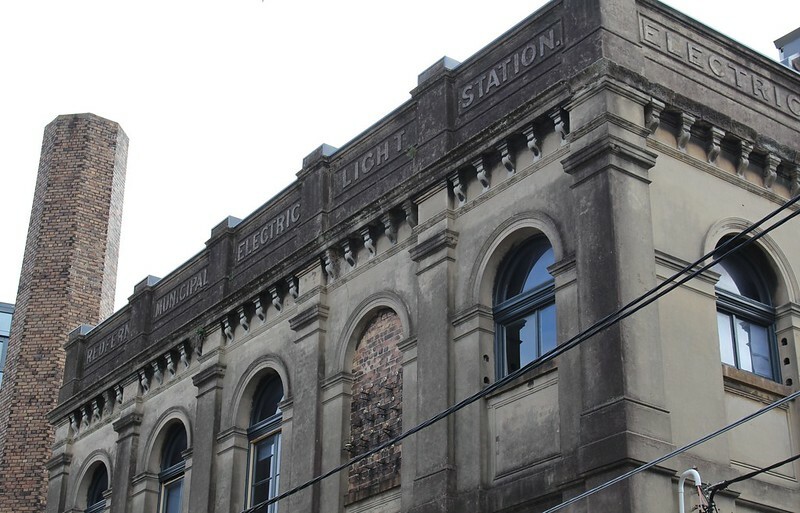 Mind you the George Street design includes wireless technology — the tracks have a conductor rail that will pass power into the trams as they pass over. This probably means more construction impact under the tracks, requiring removal of underground services. 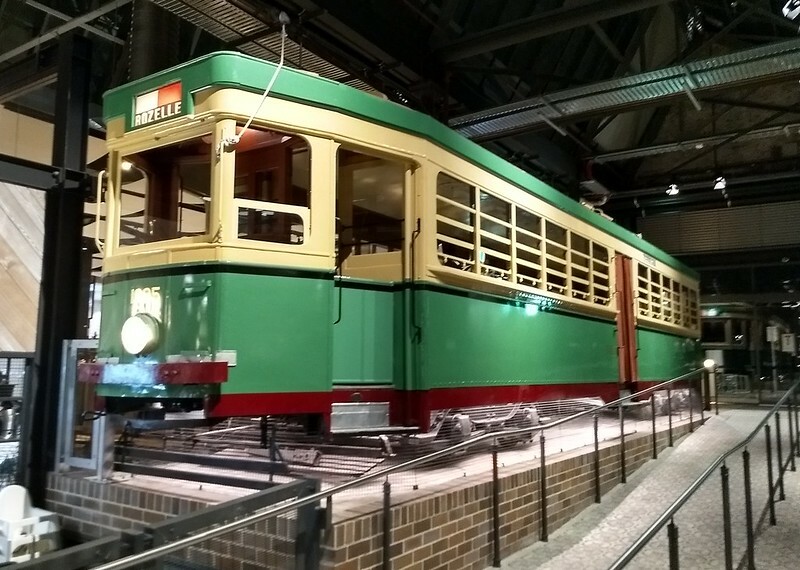 One contact also reckoned that because Sydney authorities don’t know how to build light rail (tram lines), the whole project is (over) engineered to heavy rail standards. 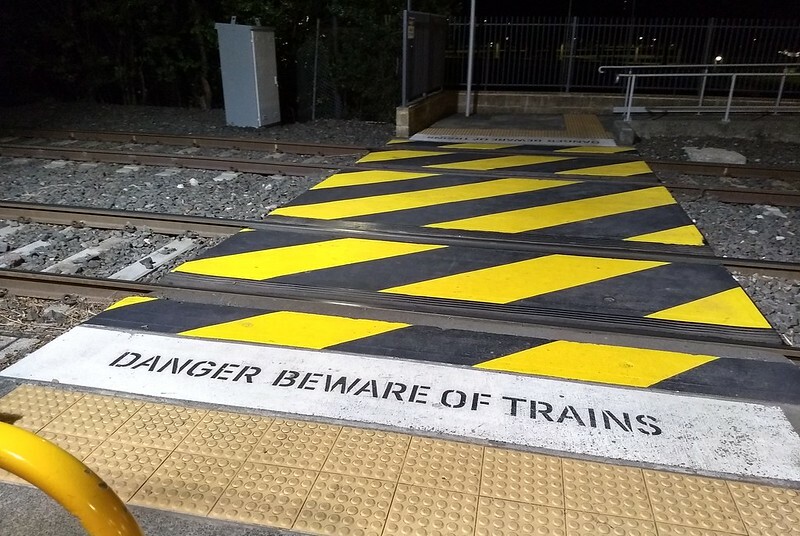 That might explain why on a previous visit light rail services were suspended due to a signal fault, and why the following day we encountered a tram/pedestrian crossing with signage that warned us to beware of trains. Despite it still being light, the sun was going down, and the gloriously warm weather from the middle of the day had gone, with the temperature dropping rapidly. Taking a somewhat roundabout route, we ended up at the Opera House, where we’d booked a tour. Being a few minutes early we sat and people-and-seagull watched. 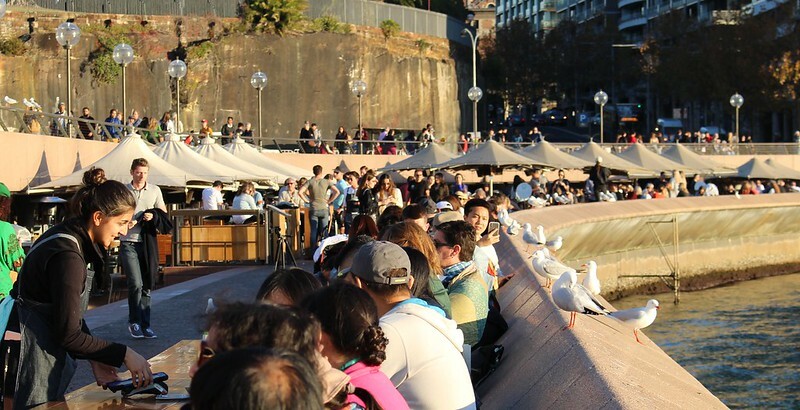 Along the water’s edge, restaurant wait staff served a row of al fresco diners, in turn watched by a row of seagulls. 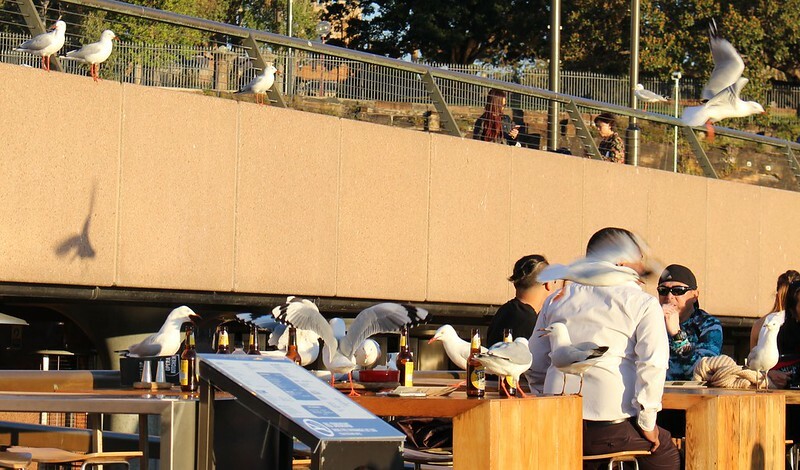 As soon as diners left, the seagulls would move in on any leftover food. 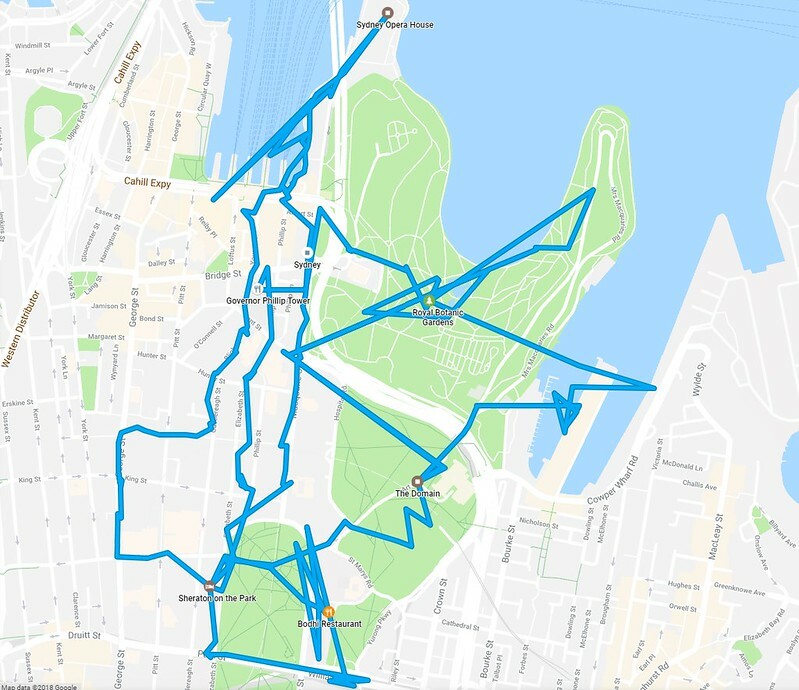 At the Opera House, they do a Backstage Tour taking 2.5 hours, which sounds like it might be good, but we decided a simple one hour tour of the building would suffice. It was very interesting, with our guide quite knowledgeable, and some fascinating titbits of information about the construction and history of the place. 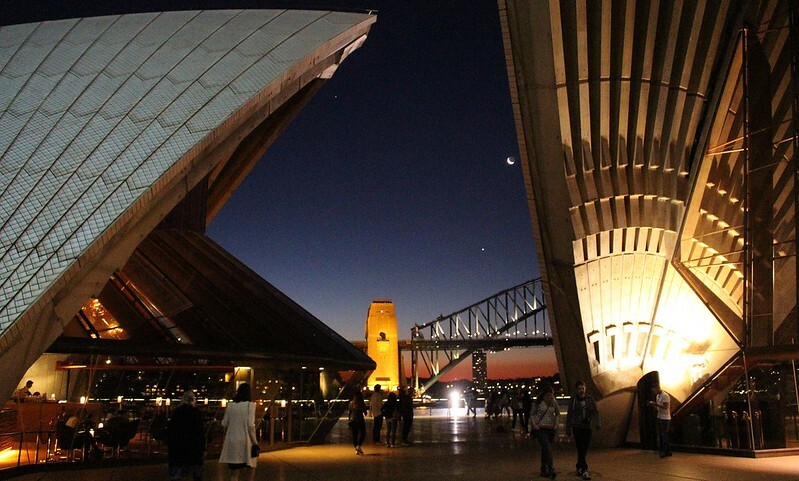 The sun had gone down, and Circular Quay and the Bridge were looking lovely in the moonlight. We kept walking, first back to the hotel, then across Hyde Park to the Bodhi vegan restaurant – another recommendation – for a very tasty dinner. Meals to share that include very delicious imitations of duck and chicken. Fakeducken, you might say? Back to the hotel. Google Fit reckoned 20,300 steps for the day. Enough walking. 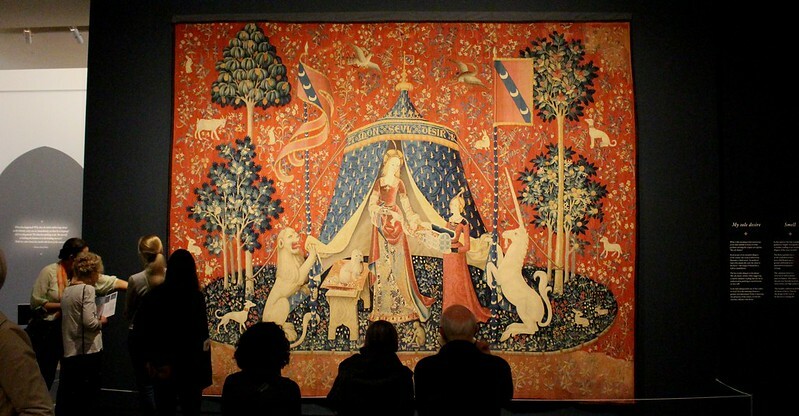 M wanted to see the Lady And The Unicorn tapestries before they head home to France from their exhibit at the Art Gallery of New South Wales. 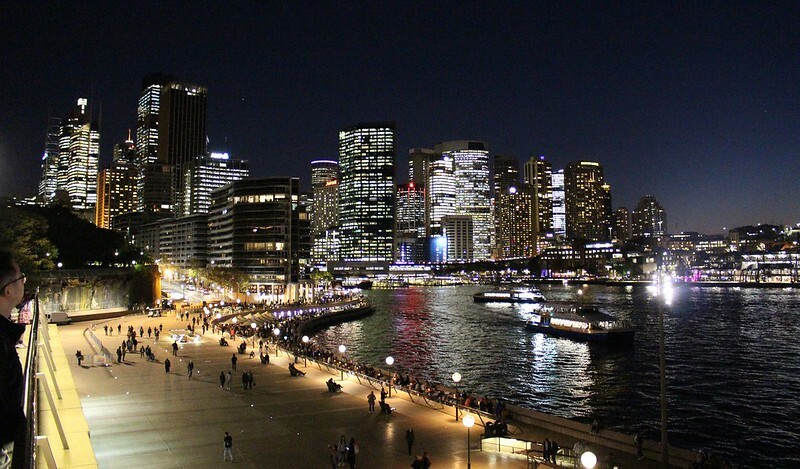 No big holiday likely this year, so how about we do a short break in Sydney? After looking at frequent flyer points on Virgin, mostly from last year’s Europe trip, we went ahead and booked. Melbourne to Sydney up on Thursday night. Plenty of FF Economy seats available. 11,800 points. Done. Sydney to Melbourne down on Sunday afternoon. No FF Economy seats available between about 10am (bleugh, too early) and 6pm (bleugh, too late). Wait a sec – they have some business class seats available at 3pm. That could work. 23,500 points. M had enough, and I almost had enough – a small shortfall could be paid with $20. Okay. M went onto the web site. Choose one of the eight available Business Class seats on the plane. Click. Booked. Great. I went onto the web site. Click. Error. No more seats available. Yep you guessed it — they only allowed one of the seats to be booked by Frequent Flying freeloaders. Perhaps to prevent people flying together in Business on points. So I ended up a later flight home — 90 minutes later. Oh well. Time to sit in the lounge and write this blog. We planned to head to the airport straight after work. Given the challenges of Melbourne traffic, I was thinking of opting-out of the Skybus ($18) and instead doing the cheapskate option: train to Broadmeadows, 901 bus to the Airport (effectively free, since I already have a yearly Myki Pass). Slower? Probably; it takes about 50-60 minutes depending on the connection. 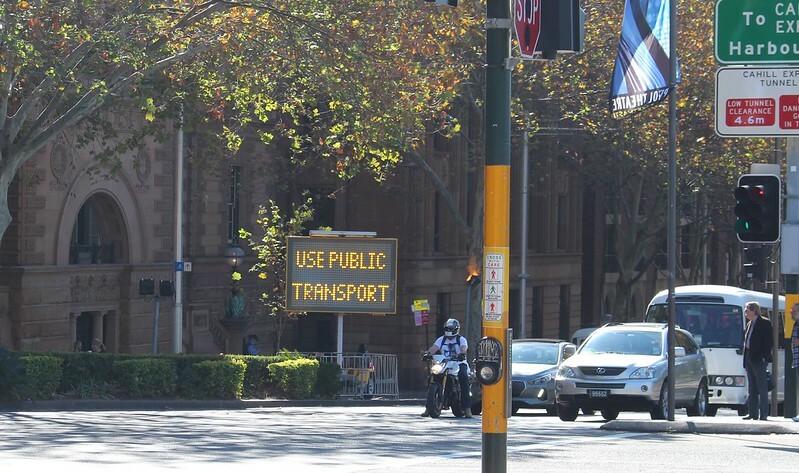 But it avoids the traffic, which Skybus would be likely to get stuck in. Checking the PTV network status shortly before leaving, the trains were running okay, but the buses… A look at the real-time departure information showed uneven frequencies, and there was a delay flagged… due to a landslide in Fitzsimons Lane in Templestowe. So we ended up on the Skybus instead, which was busy, but no waiting at all. 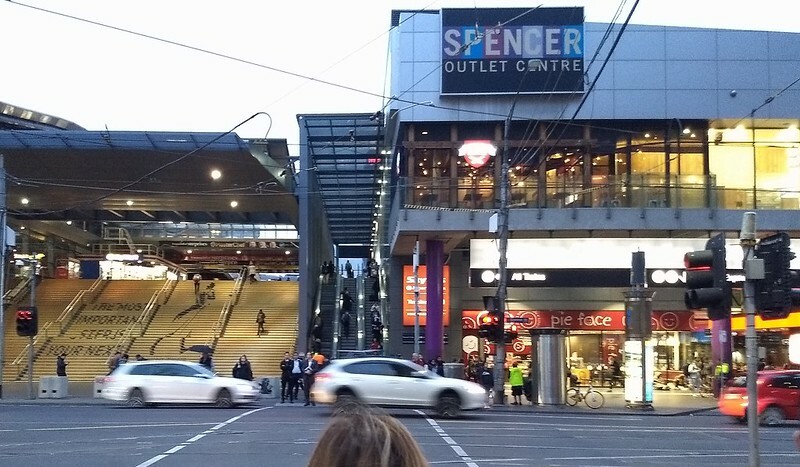 Have you ever noticed how when you approach Southern Cross Station from Bourke Street, the sign for Skybus, one of the things that occasional visitors are most likely to be looking for, is behind a pillar? As I suspected, Skybus was faster than via Broadmeadows, but not my much. The Citylink transit lanes should give the buses a good run, but don’t – presumably because they’re not enforced. Been going for 20 mins so far. Traffic crawling at Pascoe Vale. It took 42 minutes to get to the first stop at the airport. 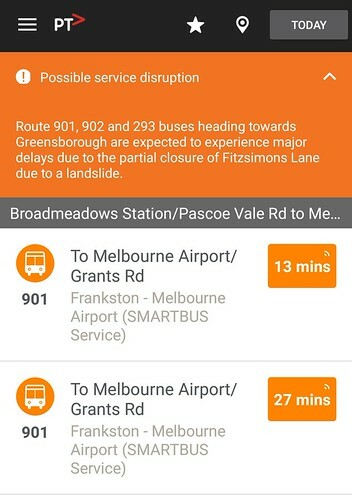 No wonder Skybus no longer claim a 20 minute journey time. Perhaps those new lanes opening soon will help… for a little while. But really, if they have a priority transit lane, they should use it properly. Of course it doesn’t help that both Transurban (Citylink) and the Airport are lobbying against bus priority. Evidently they really want to cater for vehicles, not people. The flight? It must have been an omen that our departure got switched to Gate 13, but at least Terminal 4 has improved in the last few years. Delayed about half an hour, so we got into Sydney well after 9pm. Smooth other than the delay. 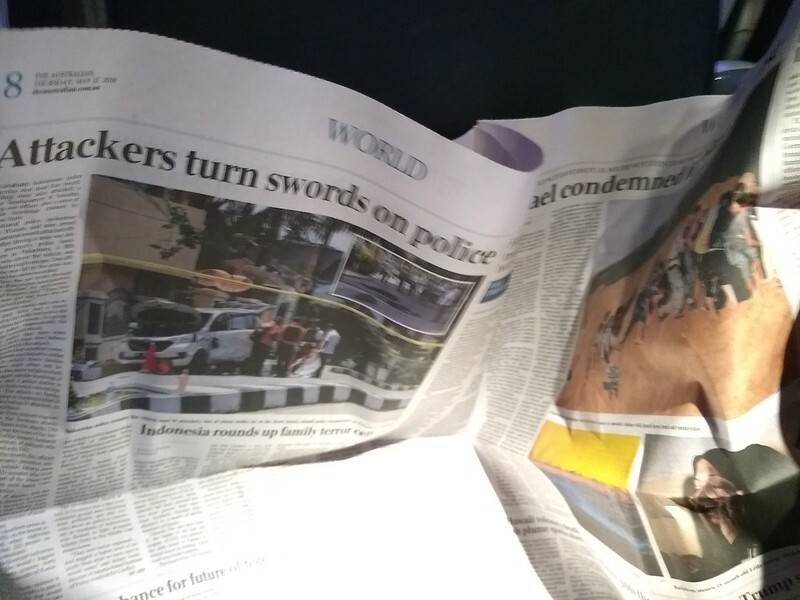 I got time to ponder why they give out copies of The Australian, which being a broadsheet is clearly completely unsuited to reading in a plane, at least in an Economy-class seat. And the train from the airport? Instead of a smooth 16 minutes straight from the Domestic Airport station to St James (at least as quick as a cab), due to trackwork we had to change trains at Central (up and down steps; there’s only one lift per platform), then catch a train the long way around the City Circle, so it took about half an hour all up (about as quick as a cab in peak hour). 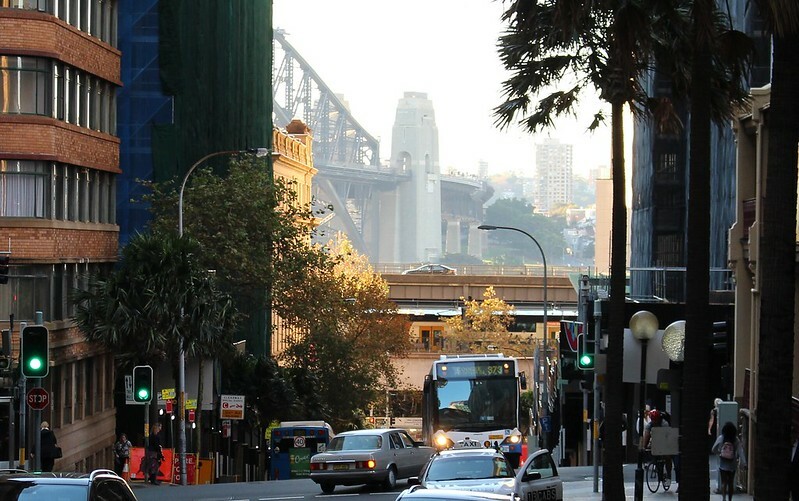 On the bright side, the view of the Harbour Bridge from Circular Quay station is a nice welcome to Sydney. The hotel was a level of luxury to which I’m not really accustomed. I usually book for location first, then price, then amenity. I like to be near to a busy railway station so we can use the hotel as a base, and stop past between activities. There was a good deal at the Sheraton on the Park, near St James station, so we ended up there. When I first started travelling in my 20s, I tended to stay at Youth Hostels for budgetary reasons. It’s fair to say this is the other end of the spectrum. As we walked up, the doorman offered to help with our bags. I declined. 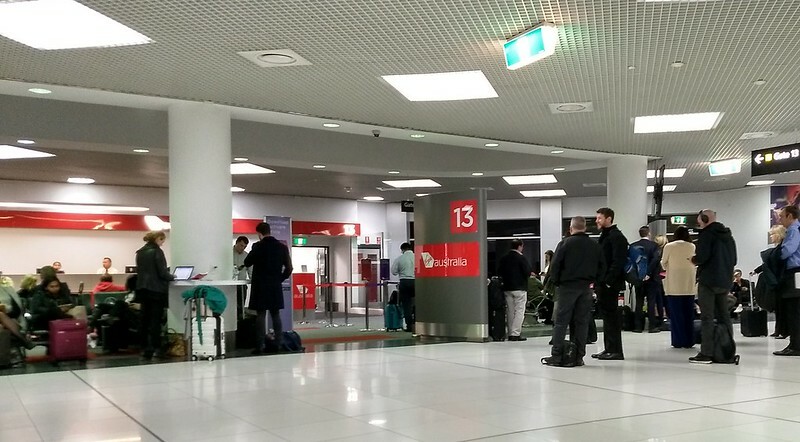 After pulling my wheeled suitcase all the way from my house in Melbourne, I didn’t need to pay a bloke $5 to have him take it the last 25 metres to the reception desk. That said, if the Sheraton want to remodel their front entrance, a ramp from the direction of the station would be a plus — currently the only ramp from the street faces the opposite direction. The room itself? Very nice. As one would expect in a nominally expensive hotel. We hadn’t booked (and paid extra for) the park view… instead it was a “city view” which turns out to be facing onto the back side of a building in the next street. No matter. Escaping a Melbourne weather forecast of grey and drizzly, instead getting Sydney’s sun and top temperatures of 20-21 degrees every day we’d be there? Priceless.